(NewsUSA) - Sponsored News - From 3-D technology to bold, bright visuals, animated movies continue to get better with time and this upcoming season is no exception. If you're a fan of animated films starring a new collection of fun, colorful characters for the whole family, there are now more ways than ever to bring your next magical movie experience home after the final credits roll. * Storybook Lane: If bedtime stories are a nightly ritual in your home, get the little ones involved by creating a storybook station in your living room. When you get home from the movie theater, channel your kids' excitement over the movie into a creative and educational exercise. Developing homemade storybooks based on their favorite movie characters with added storylines that incorporate their own imagination is a great way to bring the magic of an animated movie home, while encouraging kids to think outside the box and practice writing and artistic skills. Type up and print out their dream story while they act as illustrator to their own personalized story for added fun. * Mom Time: Animated movie fun isn't just for kids anymore. If you're looking for a new favorite online game to help liven up downtime, look no further than games inspired by some of your favorite animated movies. 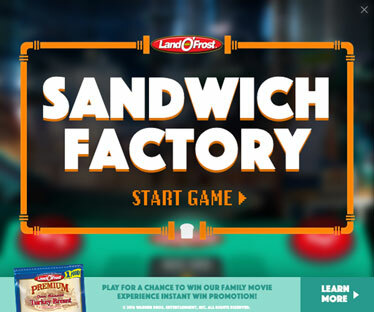 Online games such as "Sandwich Factory," inspired by Warner Brother's new movie, Storks, and the family-owned deli meat company, Land O'Frost, are a great way to have more fun with your favorite movies in the comfort of your own home. The game will transport you into an interactive sandwich factory with movie characters: Junior, who appears to "save babies," and Tulip, who grabs the finished meal from the sandwich maker. * Chef Corner: Get your kids involved in the kitchen by turning lunchtime into a movie experience. When excitement over a new movie is at its peak, encourage kids to put their chef's hat on and come up with a custom menu inspired by their favorite characters. Once the menu is set, host a lunch for the whole families where the kids get to play king and queen of the kitchen and share their creation with mom and dad. To play the "Sandwich Factory," visit www.landofrost.com/storks-game, and for coupons and more information about Land O' Frost, visit www.landofrost.com.